Ulpotha was one among thousands of abandoned ‘Puranagamas’ or ancient traditional villages of Sri Lanka’s Wanni. Tucked away in the foothills of the Galgiriyawa mountain range, Ulpotha has now been restored to its traditional life. Its restoration is a project of the East Pole Foundation together with the Cultural Survival Trust, both non-governmental organisations. It is the first experimental step of a broader initiative to appreciate and foster the traditions of our age-old agrarian culture, while respecting and protecting the environment. The Ulpotha Sanctuary provides a refreshing experience of learning the tradition by living the tradition. The village owes its name, which means ‘water spring’, to the perennial stream running through the land. According to legend, a group of andis or travelling mendicants from India were the first settlers at Ulpotha many centuries ago. They sang and danced as they travelled through Lanka in search of God Kataragama. When they broke journey at Ulpotha for the night, the seven hills, the jungle and the reservoir convinced them that it was Kataragama. In his dreams that night, the head priest saw a vision of God Kataragama, who showed him how to perform a puja. 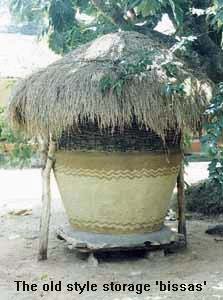 The andis thus settled there and built a devale to God Kataragama at the entrance to the village. Each year a perahera is conducted from this temple. Our visit to Ulpotha was a most interesting experience. A rough gravel track led to the village. At the entrance was a wattle and daub cadjan roofed building or wahalkada. All vehicles stopped here and progress beyond this was by foot. Another wattle and daub building beyond consisted of an outer sitting area with doors opening off it. The walls and floors were of smoothened clay. On three sides of the room, low built-up seats of clay were spread with woven rush mats and scattered with cotton cushions. Kerosene oil lamps hung from the beams of the roof while an old brass oil lamp stood in a corner. Cottages for the families working there, a kitchen and toilet all in wattle and daub and shower facilities complete the outer complex, separated from the rest by the stream. "The layout of the sanctuary is based on its traditional village origin," explained Manik Sandrasagra, Executive Director of the Cultural Survival Trust. The Ulpotha Sanctuary is the creation of Mudiyanse Tennekoon, well known village folklorist and film producer Manik Sandrasagra, both Trustees of the Cultural Survival Trust. "lt was more Tennekoon than I," Manik Sandrasagra commented. "We built this for the East Pole Foundation who funded the project. We are trying to stop urban migration by investing in an age-old vision of Lanka’s ‘alternative’ mud culture. We want to show that you can take a piece of land and make it fully sustainable. Qualitatively we can live better here than anyone in the city. We built Ulpotha as our project report, rather than waste time writing lengthy reports." The restoration of Ulpotha began three years ago. The village then was completely abandoned and overgrown. Planted with coconut some time back, most of these trees too had been cut down before the sale of the land. "Every tree has been grown by us," Manik said. Trees such as mahogany, kohomba, kumbuk and cotton grown three years ago, had grown amazingly well. Cultivation of mixed crops had also been started. Paddy and Chena cultivation as well as vegetables, yams and fruits are entirely by traditional and organic farming methods. Artificial fertilizers and pesticides are not used at all. The land produces all that is needed. Ulpotha is bounded on one side by a picturesque reservoir against a backdrop of forested hills in the distance. The reservoir or wewa is an essential ingredient of the system by which agrarian culture operates. Following this pattern, the sanctuary also comprises a walauwwa (manor house), a murtange (manor kitchen), wedegedera (native treatment centre), asanas (wattle and daub dwellings), bissas for storing grain, cultivated and forested lands. The typical sprawling, tile roofed walauwwa lay across the stream. A flight of steps led up to a verandah. Bedrooms and toilets opened off the living room. There was a central courtyard or ‘meda midula’, back verandah and a kitchen which was somewhat modernised. Manik recalled that only the foundation had existed when restoration of Ulpotha began. It was originally built of an earth based clay. Kandyan craftsmen were engaged to rebuild it under the guidance of an architect. No cement or mortar was used. It was a slow process bringing the mud from the wewa. The walls were finally painted with a paint made by soaking some flowers in water. A pathway from the walauwwa led to the ambalama. Built up seats round the low walled room were covered with cushions and rush mats were laid on the mud floors. It made an attractive meeting place, shaded by trees and brightened by the red hibiscus which grew profusely outside. The murtange nearby is the traditional kitchen where the typical rice and curry meals are prepared. Using indigenous red rice together with vegetables all grown on the land, a delicious vegetarian meal is served to visitors. 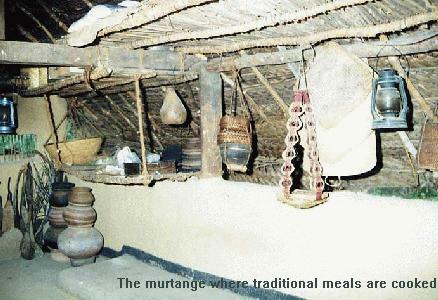 The meals are usually served on long mats laid on the verandah of the murtange. A wedegedere or native treatment centre, built in the same traditional style, is used to carry out therapies such as oil applications, massages, herbal and steam baths, cleansing rituals and such holistic treatments. The medicinal plants and herbs used for the therapies are grown around the centre. Asanas, which literally mean divine seats, are individual cottages for those who wish to experience the simple pleasures of village life. Built of clay with cadjan roof, they provide an open sleeping and living area. Though simple, it is made comfortable and attractive using clay, stone, pottery as well as fittings and fabrics which reflect traditional village aesthetics. Six such cottages are available, each of which could accommodate two to three persons. Running fresh water, toilet and outdoor shower facilities are available in addition to wells for a refreshing well water bath typical of village life. Seated in a cottage, fanned by a constant cool breeze, one experiences a peaceful rustic atmosphere. With cows grazing in a field ahead, birds chirping all around, the rocky wooded hills in the background, it would be easy to relax and unwind, away from it all. "It is an entirely different experience of sound, smell looks and everything else," Manik remarked. Appreciation and respect for nature and tradition is an important aspect of life at the sanctuary. Thus all the cultural traditions and rituals of village life are practised at Ulpotha. Most of these traditions are centred around the devale and the kamatha or threshing floor after harvesting of paddy. For instance, according to an age old practice, the members of the Rodiya clan regularly collect their share of the broken pieces of rice at the kamatha after threshing. "Ulpotha Sanctuary is an enterprise where the staff working here are all shareholders," Manik explained. "They are all families from the Wanni. It is a self-sustaining village community which welcomes those who wish to experience traditional rural life." The Ulpotha Sanctuary is open to small groups of visitors who wish to use it for their own workshops or retreat or simply share in the experience of village life. It is however only available by prior booking during a period of ten weeks during October-March and six weeks during May-August. The income obtained from visitors is used to maintain the activities of the village. Manik Sandrasagra says the restoration of Ulpotha has been a marvellous experience and they have learned a great deal by it. It could be done in many other ancient abandoned villages as well, thus preserving some of our ancient traditions and skills. For their next project, they plan to restore a forest aranaya or meditation centre. A seaside village in the Udappuwa area where the local customs and traditions are very different and distinctive, is also being considered.